Showing results for tags 'bow hunting'. Hi all, I'm new to the forum and glad to be apart of it. I'm a first year hunter and I love every part of it. I hunt on private land in 6J near Boonville. I've seen a few doe and 1 buck. Has anyone else in this area or anywhere else been experiencing this? There is so much sign of deer, but nothing when it comes time to hunt. I see 100 deer a night on the side of the road, but none when hunting. Also, if anyone has any tips for a newbie, that'd be greatly appreciated. Thanks! I was wondering how many of you plant and effectively use "kill Plots" on your hunting lands. I have 47 acres in the lower Catskills that I picked up last year. I have to do quite a bit of land management as much of the woods around my fields had been logged about 10 years back and is now an overgrown mess that's great for deer cover but impossible to navigate and see more than 10 yards through. On the bright side the top of the mountain is great and my entire lower field is corn which is farmer managed and my middle and top field is hay. I will be keeping a lot of the under brush for bedding and travel cover but want to cut trails through it to help redirect deer travel. My other thought was to make a few 50-100 yard wide by 100-300 yard long staging or kill plots in and near the cover to catch the deer before they make their way to the big fields at night. After dark the hay fields are absolutely covered in does. My question is how many have used this tactic and what are good seeds to plant, being that I have corn and hay would a late season browse like turnips and radishes be best or an all around option like clovers and oats? Hunting NY - Its that time again already, Bow Hunting In NY has started! Hello to All, New to this forum. I'm an old fart archery hunter. 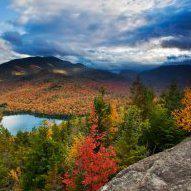 I live in VT but do a lot of hunting in the Lake George area Adirondacks. It's tough bow hunting and even gun hunting is a real challenge. This year I'd like to broaden my horizons...... I'm planning to drive out to Yates County this coming weekend just to hike some public land and am considering either High Tor WMA or Italy Hill State Forrest. Anybody have any experience hunting either of these areas? I'm sure they get a lot of pressure during the gun season but I'm wondering how much pressure they get during the archery season. Thanks! Hello to All, I’m new to these boards. I’m just an old dog bow hunter from Vermont looking to hunt more of New York this year. I spend a lot of time in the Lake George Region Adirondacks although I’ve not tagged a buck there in a few years. I’m looking to hike some new areas in Region 3 (looking at Orange County but open to ideas!) 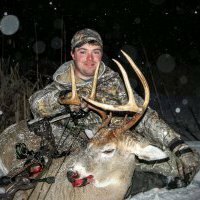 and was wondering if anyone could offer advice for Bow Hunting on public land. Does public land get a lot of pressure during the bow season? I’m sure it does for gun. Anyone hunt Pochuck Mountain State Forrest? Can a bow hunter avoid being run over by fellow sportsmen trying their luck? Hello all, newbie bowhunter this year. One question, how do you deal with seeing so many deer during bow season but not be able to shoot them from 20 yards when still hunting because they see your every move. Even when trying to draw and lift bow slowly they seem to catch me every time, keep getting caught with my pants down. Hi everyone... Originally from Northern NY, relocated to Nassau County with a camp on Black Lake near Hammond, NY. I'm a deer hunter, ice fisherman and summertime griller with either venison or fish grilling with the best rubs and jerk to make meat come alive. I process my own deer, making steaks for jerking to sausages of all kind. 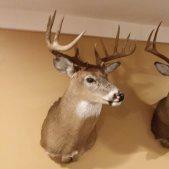 Ever in the neighborhood, come on in and have a beer, check out my 10 point scoring 141 7/8 in 2003. Looking for 2 hunters to come in on a lease in Pocono Pa. Its a year round lease which consists of 210 acres. The property is located right over the water gap about an hour from NYC. Asking $1,250 per hunter. Hey guys I had a quick question that I cant find a clear answer out on the DEC website. My little sister is finally getting her hunting license this year. She will be doing a combo course for Hunting and Bow in March. Now my question, is she allowed to sit in a blind with me for spring turkey? She would obviously not be hunting, nor even holding a bow, just to sit and accompany me while getting used to sitting in a blind for hours. I know she obviously doesn't have 2014/2015 tags so I just want to make sure its okay for her to sit with me. I thought it would be a good way to break her into sitting quietly in the spring rather than in the fall when she will be purchasing a 2015/2016 license. If you could help me out I would really appreciate it. Check out this photo and the size of that silencer. The police need to catch this guy before the rut kicks in. Totally ruined the first couple of Weeks of the season. Hey guys I wanted to upgrade a few components on my bow including my sight. I was thinking about getting a one pin sight like the AXT Archer Extreme Driver 1-Pin Bow Sight so I could dial the distance down and not be blinded by the different pins. Although now the more I think about it it just takes that much longer to dial down a deer then to ready the bow aim and shoot after zapping em with a range finder. I have heard some great reviews on this specific brand I was just curious to see if anyone has used one before? Hey guys I was thinking of purchasing this drop away rest for my pse dna. The bows a rocket and I want a good drop away. Been using whisker biscuits but my biscuits kinda burnt! hahaaa anyhow if anyone has any experience shooting with this product let me know what you think! GOOD LUCK OUT THERE!!! !